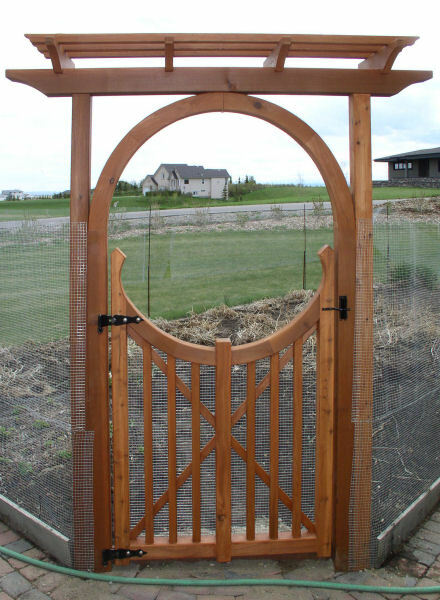 As we planned to raise the fence around our vegetable yard to keep the deer out, we also needed a gate. 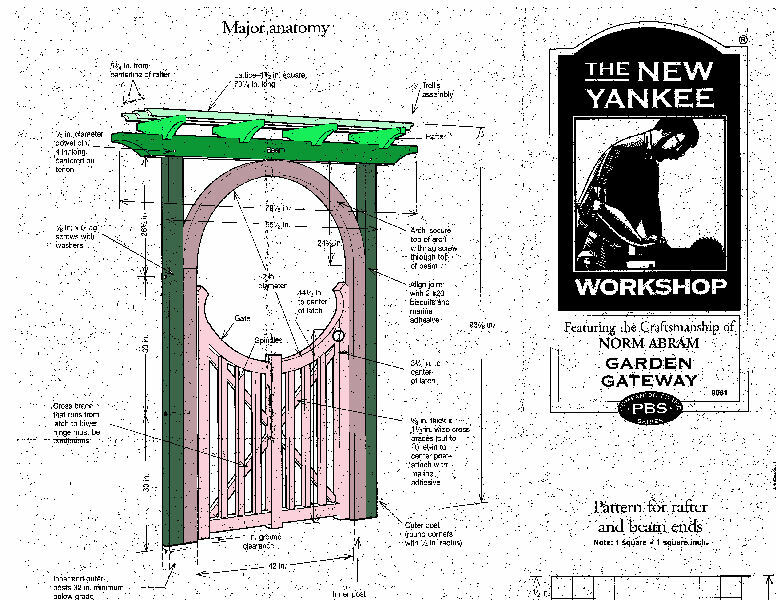 The New Yankee Workshop just happen to have a plan for a great looking garden gateway that also was the exact size we needed. A bit expensive, because we used red cedar. The reason being that it is very durable and light; especially when you consider handling 8 feet long 6"x6" material alone. And then I love the smell of cedar. 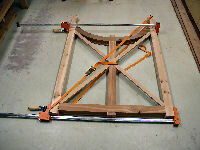 The plan is taken from the New Yankee Workshop, plan #9061, Garden Gateway. You can order the plan with a video of the project. I did not order the video as I am used to the clear plans of Norm Abram. 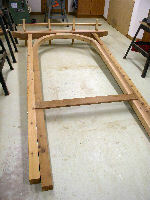 The two end sections for the gate arch are indicated as 18" on the inside measurement. I found that that is too long and that 15" is more than enough. The cross braces are taken from an 8ft long 2"x6". 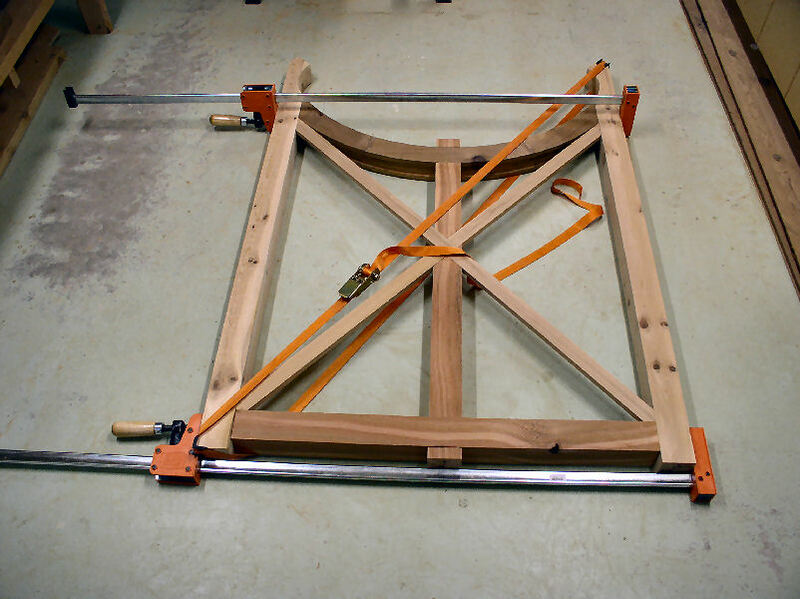 For one cross brace a length of 53" is required. Hence, not enough is left over out of 8ft for the other cross brace. Just so you know. No detailed material list, as that can be found on the plan. The plan recommended pressure treated Southern Yellow Pine, something that is no readily available here. 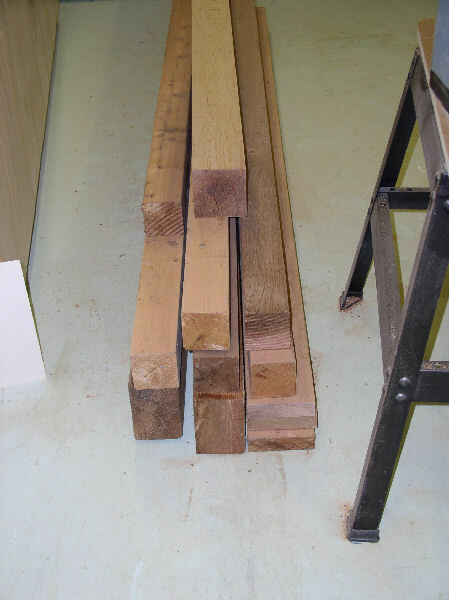 We selected Red Cedar instead, as we used that already for various other outdoor projects. The hardware we got from -- who else -- Lee Valley: 8" Pin Hinges (01S12.20) and the Self-Aligning Gate Latch (FG135) instead of the Twisted Ring Gate Latch that Norm Abram suggested. 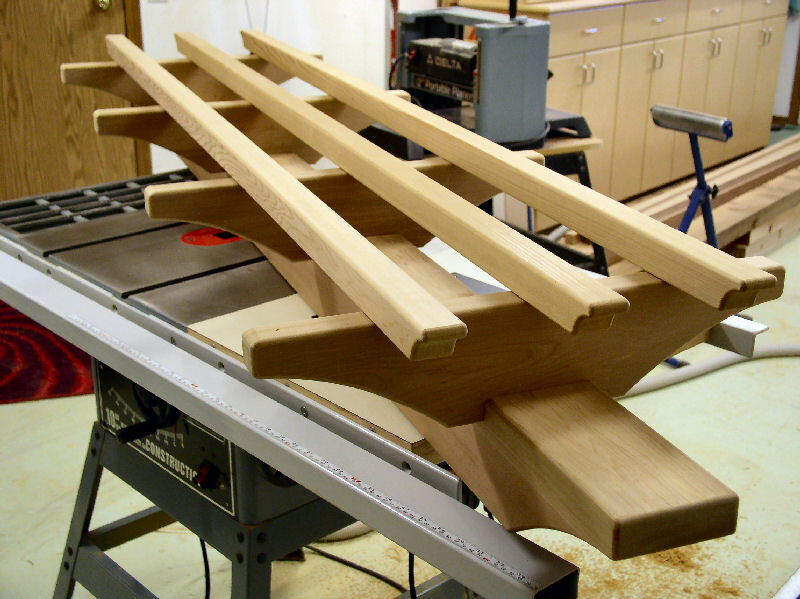 Power tools -- table saw, miter saw, planer, jointer, band saw, router, hand drill. 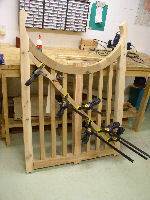 Hand tools -- hand saw, chisels, tape measure, clamps, straps. Followed the instructions on the plan. This project had many challenges due to the size of the raw material and the limited size of the powertools. 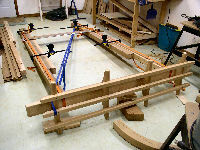 The main challenge was to resaw/rip and surface plane 8 feet long 6"x6" and 4"x6" rough red cedar with a 10" table saw with a cutting height of just 3". Add to that very short in/out feed tables of the table saw, planer and miter saw, in addition to the limited space in the workshop, and you get an idea of the time consuming efforts to move around power tools and adjust roller stands. It can all be done, but it is just time consuming for a relative easy project. Another example. 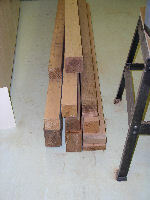 After reducing the 6"x6" to a 4½"x4½" finished size, the cutting to length was another challenge. The opening between table and blade of the miter saw is barely 4". Hence, back to the old hand saw. 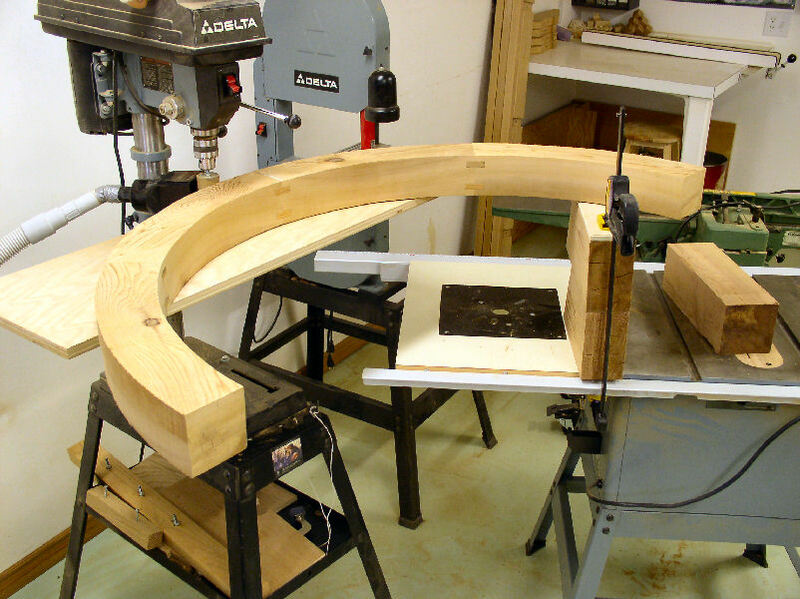 After gluing the sections together for the gateway arch and the gate arch they had to be cut with the band saw to form the nice arch. In order to handle the arches and keep them flat while sawing, I had to build a temporary platform on top of the table saw, and move the whole lot against the band saw. 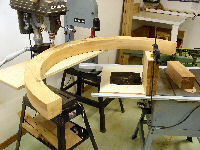 The band saw blade is only 3/16", and the band saw was bending when I cut the gateway arch. I suspect that the saw blade had stretched over the years, because after tightening the blade some more everything went fine. After cutting out the gateway arch, the outside diameter measured a wee bit over 48¾". The arch was sanded and should now measure exactly 48¾". Yeah, right. The diameter measured 48 3/8" instead! 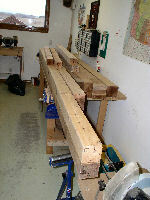 Cutting the wood and letting it rest for a few days in the indoors dryness has caused it to loose 3/8". In this case I was lucky that I could still adjust the gateway posts. Another valuable lesson learned. At this point in time (13-Dec-2004) the construction is finished. 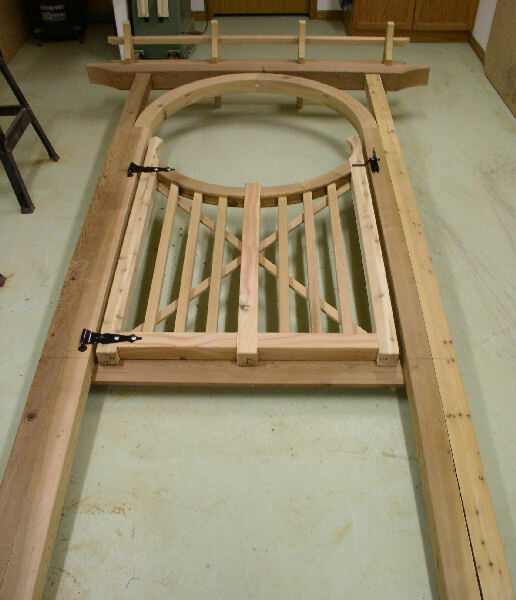 In spring 2005 the garden gate will be placed outside and then treated with two coats of CWF-UV from Flood, with a Redwood colour, as we did for all our outdoor projects. At that time we will make the final photo. 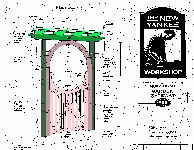 The New Yankee Workshop, plan #9061, Garden Gateway. Updated: 5-Feb-2019 18:24 EST -- Copyright © 2003-2019 Pieter van Vliet. All rights reserved.